Domino is a beautiful gypsy gelding. Domino has all the flash and beauty wrapped up in a gentle, personable package. Domino stands 15 hands, weighs 1250 lb and is very stout built, with good foot and bone. Domino has had three years professional reining training and rides around very fancy. He moves well off your legs, he is very soft in the face, turns around correctly, and will stop smoothly on his hind end. Domino has also been driven and used in many weddings. He is easy to drive and will go anywhere you ask. He has no spook or buck. He has been ridden in parades and nothing phases Domino. 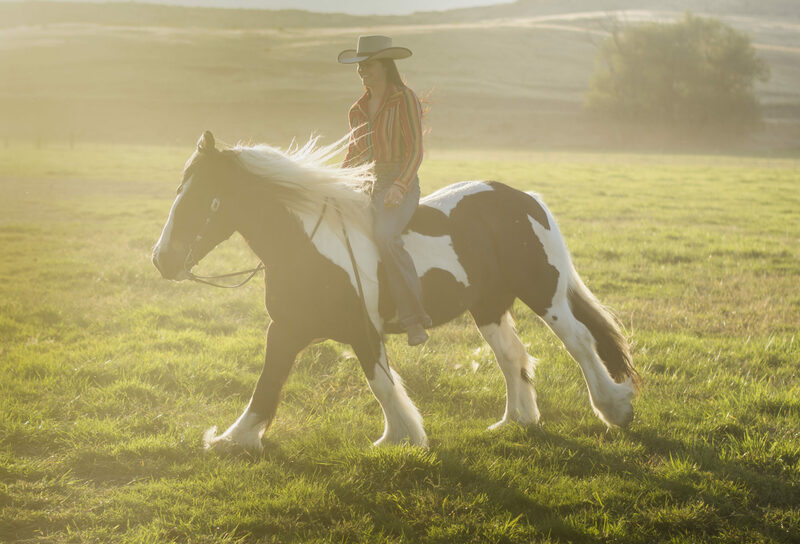 Domino has also been ridden on the ranch and will do all the jobs. We have used him to gather, sort, doctor and brand. He is very easy in the branding pen and you can tie one down on him if you need. He walks out nicely all day and will ride off alone with no issues, you can lead or follow. We have taken him to the mountains on pack trips, and trail ridden him in the Arizona desert. He handles all the different types of terrain with ease and is very sure footed. No matter what type of riding you like to do, Domino will be an enjoyable partner! I cannot say enough good things about this sweet gelding! Give me a call, I would love to tell you more about Domino!